The show was a complete sensory overload, and it didn’t help that I had only a scant hour and a half to spend there. Despite the overwhelm, though, it was great to see such beautiful work, such creative energy. As someone who is going through a bone-level metamorphosis with relation to business, I found myself paying particular attention to the pricing and marketing strategies as I raced around. I saw various models, ranging from “How do they even cover their costs?” to “Whoa – I am so not in their target market”. Intricate jewellery for a few euros. Wall hangings for four-figure sums. Every conceivable price in between. The lowball prices started to worry me after a while. 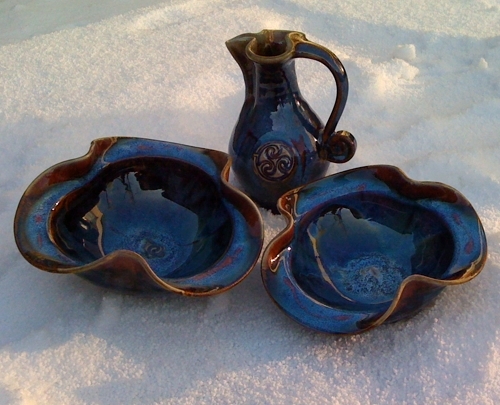 Take the pottery pieces above (photographed against the dramatic backdrop afforded by our recent freakish cold snap). They’re by Colm de Rís, and I love them: the subtleties of colour, the flowing shapes. He charged me €25 for these three, in total. How, I ask you, is that not a rip-off (of him by me)? I also bought a lovely Christmas tree ornament from Little Red Woodworks, a new company that was exhibiting at the fair for the first time (and whose designer is a friend and sent me a free pass – thanks, Dee!). I haven’t had a chance to ask how the weekend went, business-wise, but I really hope they’ve put their prices up this year. And then on the other hand, I wondered if the fabulously high-priced work was shifting at all, not least given the straitened economy. Perhaps selling at the show wasn’t those exhibitors’ first priority, of course – I suppose it could have been more of a visibility exercise. I spoke to another friend who was exhibiting at the show – Peter Cox (hugely talented landscape photographer who sells prints and teaches classes; go and buy his stuff) – and asked him for his take on pricing. How do people make a living from handcrafts? A lot of them don’t, he told me. Over the years he’s seen plenty of companies starting out all optimistic and industrious, and then disappearing after a year or two in business. This scares me, both because of my ever-present perfectionist streak and fear of failure, and because it suggests that I may be dooming myself to a life of financial worry and miserable scraping-by if I try to do this thing. In the heaving sea of shape and colour, something catches your eye – something thrilling. A single, stunning centrepiece, or a few unique, beguiling items – either way, you just have to take a closer look. You reach the stand and discover that what drew you here is fantastically, majestically, uproariously expensive. Way beyond your budget. As you knew it would be. You sigh. You turn away. You look again. You want it. You want its beauty, its passion, its power. If you could hack a piece off and carry it home in your pocket, you totally would. And perhaps … perhaps you can, in a way. You scan the other merchandise, the flickering shadows of this Platonic ideal. Immediately, you see that there are several things you can afford – a range of items, in fact, at a range of prices. Sold! Done deal! It remains only to make your choice and complete the transaction. You win, because you are acquiring a small piece of the magic that created the beautiful piece that drew you in. The craftsperson wins, because they are one step closer to next month’s mortgage payment. All they had to do was ensure that there was (a) something striking to bring you closer, and (b) plenty of things you could buy when you got there. I assume, moreover, that what I’ve just described has some official title among people who routinely talk about pricing models and pain points (ugh, yes, they really do) and upselling. My take on it is no doubt risibly naive. I don’t care, though. I prefer to talk about magic and mortgages, if it’s all the same to you. Unless they are, like, toys, not a full size jug you could actually use, that’s a total ripoff. Wow. Perhaps he needs to empty space? What’s a pain point? What’s upselling? I saw a craft person interviewed somewhere (Nationwide, maybe?) who said that at each fair he picked one or two random items from his selection and added a zero to the price tag, and those items were guaranteed to sell by the end of the fair. I’ve had a similar experience in contracting – with a couple of jobs I didn’t particularly want, I pitched a high price to put the customer off, but found I got selected anyway despite complaints that “that’s way over what the next guy is quoting”. There are people out there who want to pay for the expensive item because they think it’s better, despite any evidence to the contrary – cover your bases and price for all markets. People do not respect that which is underpriced. I used to charge a cup of coffee for tarot readings in college because I discovered that if I did that people would actually pay attention, giving a tarot reading for free had people wandering off and/or engaging in another conversation. I’ve also seen the reverse, where people charge too much and people feel ripped off. Now if I could only convince my dad to charge the worth of his work. (Knowing nothing about art or marketing, mind you!) This is the key sentence for me. And is a case for artists to create the magical peices that they are passionate about and trust that there are poeple out there who will fall in love with exactly that magic. To me, part of your post echoes debates in the zine world, except very few zinesters ever envision making a living from it. But there’s this conflict between “you make zines for the love of it, and we’re all punk rock and DIY and everything should be cheap as hell” and “this is your art and you deserve to have it recognised” (which was pretty much what Kate Bornstein said to me when she paid ten times the given price for one of my zines after I tried to give it to her for free). I’ve always gone the “cheap as hell” route and accepted that I’ll make a loss, but I think it’s also true, as Deirdre says, that (some) people do not respect that which is underpriced. Yes! I’ve never thought about it coherently, but I do remember walking away from a stall disappointed, cos I loved what they had, but there was nothing in my price range. Also, do you need to make a living, or just a profit? Clothes shops do this. At Christmas time, they put sequinned dresses in the window, because these draw the punters in. Who then buy a more much understated party dress for themselves. Also, hanging brightly coloured clothing at a height tempts people over to the racks underneath. Finally, something like 80% of people turn right when entering a venue, so you want your stand to be there. @Ailbhe: A pain point is a vulnerable, tender spot in your prospect’s psyche, to which you draw their attention in your marketing copy so that you can then propose to heal or save them with your solution (“Are you stupid and ugly? Take new Beaut-IQ!” kind of thing). And upselling is trying to persuade a customer to spend more than they intended, by suggesting upgrades or add-ons. The thing is, both of these techniques can be used in the context of a genuine and sincere desire to help people. But the language is still icky. @Sharon and Deirdre: Pricing is weird. @Pearl: Well, it’s a nice theory, anyway! At least the Internet gives artists a chance to connect with the people who are going to love their work. @Nine: I know, and I have huge internal resistance to moving from one camp into the other (although I was never all that punk rock). But realising that I actually do want to make a living at this has catalysed all kinds of other shifts. It’s very odd. @Mollydot: Heh. The scenario I’ve outlined may not work so well for people who are as clutter-aware as you! On the question of “living” versus “profit”, well, I’m pretty sure I’m going for “riches beyond the dreams of avarice”. Not really. But I’m definitely going for “living” – that part is important. @Actionreplay: Clothes shops! They so do! And I find that I’ve always understood that without being aware of it: I go into the shop that has beautiful stuff in the window, to see if they have anything for me – and not to buy the stuff that has drawn me in. Iiiiiinteresting. Wow. I think I might pretty much agree with Bill Hicks about people In Marketing today. Probably unfeminist of me, but I think profit would be enough for me. Though I may change my mind were I to actually earn money via crafts. I do remember in my teens selling framed calligraphy for less than the cost of the frame. I was so delighted that somebody wanted to buy my stuff that the price didn’t matter. @Ailbhe: I hear you … and yet, here I am, looking for a way to do it without wanting to rip my own fingernails out. @Mollydot: I’m interested to see you characterise it as unfeminist, because I would’ve loved to have done a gender-based comparison of pricing at the craft fair (and of course there was no way I practically could). I suspect there is a bit of kyriarchal thinking in the thought that profit would (or “should”) be enough. But that’s not the whole story – I think there are also cultural beliefs about work versus play, and enjoyment, and deserving, and art and craft and money. It’s complicated! There’s a pretty major distinction between people in marketing and people doing it for their own stuff, I feel. Unfeminist, because I would be happy to supplement our joint income, rather that support myself. It makes me think of “pin money”. Forgetting about gender things for a moment, it would be nice if my hobbies gave enough income to break even, rather than just being a cost. But if I was to put a decent amount of work into it, which is probably necessary to make any money, I would want to at least make a profit. I think that if I worked enough to make it a full time job, I’d want to make a living. But I don’t particularly want to work full time. If it was just about money, I wouldn’t consider leaving computers. Part of my living vs profit is contributing to the household & valuing women’s labour vs well, really, we’re incredibly well off compared to many people anyway (most on a worldwide scale), do we really need two good salaries? & money isn’t a measure of a person. Ahhh, this one strikes a chord. I’ve been to those shows and coveted that magic, and fallen prey to that exact strategy – coming home with a little porcelain brooch from a stall that had amazing sculpture, type thing. And now I’ve got an empty etsy shop, waiting for me to take the final step that says that scary scary thing “yes, my stuff is good enough to pay money for” like your macaroni necklace post. It’s actually also a strategy that’s suggested in an etsy ‘how to build a successful shop’ guide, having items at a wide range of prices. I think it’s worth keeping in mind. @Ailbhe: Yes, that distinction is pretty solid for me too! @Mollydot: Yes, I agree with most of what you say. But I have a strong aversion to “pin money” – I want my own income, dammit. Also, N isn’t thrilled about having three dependents. @Julie: Yes, I’ve done exactly that thing of buying a little, pretty thing from the stand with the big, magnificent thing too 🙂 I’m glad the “wide range of prices” is a Genuine Business Tip – makes me think I might be on the right track. Of course, I don’t even have an empty etsy shop, let alone anything to put in it! I stumbled across your discussion and was interested as i have just turned fulltime in the craft industry after years of pocket money making. it is extremely hard to price things, i want people like me to be able to buy the stuff i make but they can’t afford it as it is so time consuming and a stand at the RDS this year starts at €1600, I would need to make from now until december just to make the stand fees. I think unless you are very lucky and end up only designing and not making you can only make a small living from craft. @Kokokaren: Wow, your work is really beautiful. I’m really struck by what you say about making a living from craft … have to admit, I hope you’re wrong 🙂 Part of it, I think, is about the perceived difference between “art” and “craft” – which is a whole nother can of worms. I’m drifting into this one late, having meant to comment at the time. Having been brought up in craft fairs (well, strictly, brought up in the workshop, but you get the idea), I have a pretty clear idea of the pricing process, which goes like this. I’m taking an arbitrary amount per month for demonstration purposes, and turned bowls because that’s what we made and sold. 1) People who cross the threshold of a craft fair are already expecting to fork over some amount of money. Practicality, and the price of melamine salad bowls from Thailand, are not forward in their minds. 2) Craft items are bought as gifts in ~75% of cases. People spend more on gifts than they will on items for themselves. 3) There is someone in the Kilkenny Shop, or Avoca, or somewhere, who is looking at a very similar bowl, and pricing it at 175. And they’ll get that for it. The people who are pricing “outrageously high” in craft fairs are basing their prices on what they see in those high street shops and galleries. They are selling, and they don’t need to sell all that many items to break even on the show. Further, each item they sell more than covers its costs, which does strange things like allowing for overheads. The “shiny thing in the middle, cheaper things around the edges” model, which works well for actual sales, doesn’t always result in satisfied customers. As someone who does work in Marketing, I’d prefer to have a satisfied customer who will come back and buy more over a customer who bought something because they couldn’t get what they wanted.